While I do love Christmas – the visiting, eating, and even the presents – I don’t love the clutter and mess, the frantic rush to get everything done, and then the let down when I didn’t get those cookies baked, or find just the right gift. Every year we give out the girls school photos to all our family and friends. It’s an easy gift, and you can pair with the handmade crafts I talk about in the next point below. We also include them in Christmas cards for far away folks that we may not see often. It’s great to share new photos of the girls each year. There are still a few people out there who aren’t on Facebook! Christmas Card 2016 – Created in Canva! Last year I used Canva (no affiliate link, just like them!) and uploaded my own photos. We printed them at a camera store and boom, cards ready to go. We used to make them at a Walmart kiosk, but there is often a lineup and I hate queueing up for that stuff. Honestly, the outcome was not as crisp, but it was quick and easy for us. When people ask you what you want for Christmas, tell them! This year I’m telling people edible gifts (snack foods, gourmet treats) and a few items of clothing. (I need new “around the house” pants because mine have all developed holes in the last few months!) It’s okay to be specific, and to say you don’t want knick knacks. Come up with a few books, a movie, something you really need around the house – that way you’re ready when some one asks what you’d like. This is an amazing option for saving everyone time and money. (I don’t mean for your kids, but other grownup family members, or close friends etc.) Spend more time together. Cook some great meals. Do a cookie swap evening. Getting together over the holidays is more fun when there isn’t a stressful lead up by the need to find the “perfect gift.” My sister and I do this, and it’s great. I really wish I could convince others to go with no gifts as well. Then it would be even easier to save time and money at Christmas! Tell me your tricks to get your holiday self together without spending your entire bank account, or going completely crazy from being way too busy! Even the tiniest tidbit about how you let the kids wrap gifts without stepping in and helping (by taking over and doing it yourself), and how that totally works for you. I’m ready to be inspired, so hit me up in the comments! I kind of stumbled over the idea organically last year. I think this year I can do better now that I have more experience with Canva! Really? I think they still do school photos in secondary school here. They did when I was there. (But that was a few years ago…) You can always try snapping your own photos of your kids. I use those photos for my Christmas cards! Ours turned out well this year – I think the photographers must have different training now, than when I was in school! Making your own photo cards is a great idea, might have to think about doing that. Love this! 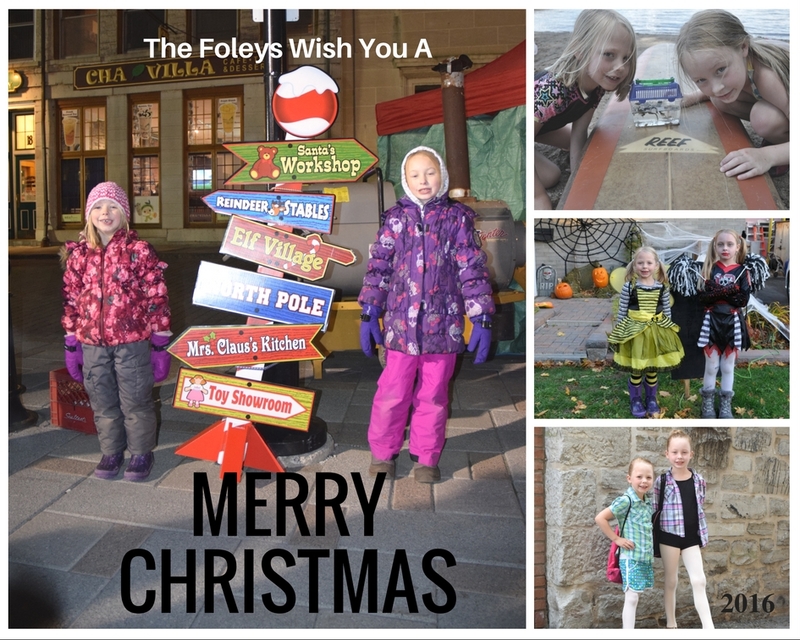 I use Canva for my blog…I never thought to use it for Christmas cards. What a great idea! Thank you! I’m glad I shared. It seems a popular tip. Thanks for the comment Sara! The no gift one is good. We have an agreement amongst friends that we don’t do gifts except for a silly £5 secret Santa lucky dip. We only really splash out on the kids and each other (but our gifts to each other are things we need…I’m getting a mixer this year!). Family gifts are kept small, and the emphasis is placed on time together instead. Getting together is the best part of Christmas – I think! Though sometimes the travel can be a challenge with the weather here. Years ago my husband I realized that we buy what we need and neither of us wants more “stuff”. So I gave us a $25 limit for each other. It requires us to be totally creative. Sometimes it’s a few used books on a theme, one year he bought me a whole set of colored pens and made me find each of the 50 via scavenger hunt, last year it was a month of picnics planned, one year I made him a Moroccan cookbook and made all of the common spice mixes and sauces. We both have a lot of fun planning out our gift to each other and we are always really excited to see what they other came up with on Christmas morning! Way better than a sweater I could have bought myself! What fun ideas! Having kids means we focus a lot more on them than on each other. Which is great because we just buy what we need when we need it, much like you. It really does get overwhelming. Thanks Helen! Thank you Naomi – I hope you found something to help you out! These are great tips! We are unfortunately at about a $0 budget for Christmas this year. We only plan to buy a gift and a couple stocking items for our son, and probably one gift exchange gift for my family. I was thinking of using Canva for Christmas cards as well. Did you just print them on 4×6? I created the image and then emailed it to a photo printing store. But you could easily do that. Canva has different size options, so you can poke around there to help you decide how to print them. what thoughtful tips. Sometimes time well spent with a loved one is the greatest gift we can give to someone. Found you on #fabfridaypost. Great tips. We’ve been trying to persuade our family to not bother with gifts for adults for years with varying success. There is nothing we want or need that we can’t just go out and get ourselves and I’d rather make a bigger fuss of the kids in the family. Sometimes it’s hard to convince others – I find the same. I think for some the opening of gifts is an integral part of Christmas. I don’t need a ton of gifts though. (Especially when I’m trying to cut down on clutter!) Thanks for the comment Alana! Clutter is my nemesis. I like the price point idea! Thanks for sharing Vicky. We make our own photo cards too which are definitely cheaper than buying Christmas cards. The problem is now that the postage is so high! I hope you enjoy your family time Catherine! Sometimes that’s the best gift of all. What a fun fundraising idea! And ya, saving time in any way totally works. These are fantastic tips. I love the idea of homemade gifts and I’m trying to slowly shift that way – but since we already bought all the gifts needed for this year it will have to wait until next year. Asking for specific items is great as well, especially if they are things you need. I’m glad you liked my post Sarah. For me Christmas is more about spending time together than gifts. But there are lots of ways to keep it more budget friendly, if you’re going to be doing a lot of buying. I hope you can use a few of my suggestions in the future!